While "homely," "lo-fi," and "endearing" are terms often brought to this nineties cult/college radio band from the Boston/NH borders, the core of the matter is story telling, black comedy, and a visionary originality with words, images, and catchy melody. 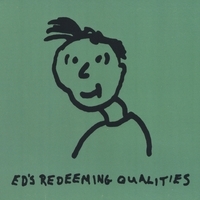 Ed's Redeeming Qualities was an alternative folk group formed in 1988 in between graduate writing classes at the University of New Hampshire by Dani Leone and Carrie Bradley, with Neno Perrotta. A little later, they were joined by Dani’s cousin Dom Leone, who moved from Vermont to enlist after delivering a number of songs by phone. They quickly earned a loyal following, with their charming lo-fi recordings receiving extensive college radio airplay in Boston. At some point no one can actually remember, they started to do a Sunday series called “Ed’s Basement,” at the now-defunct Rat in Kenmore Square. These loosely organized variety shows featured Ed’s plus various musicians, readers and other performers. Some of the the special guests who dropped in to play included Robyn Hitchcock, the late River Phoenix and The Breeders. Dom Leone died of cancer in 1989, and the band moved to San Francisco. They made two records on the Flying Fish label as a three piece, then added new member (and old friend from UNH) Jonah Winter and produced two more records on Slow River Records. The band retired in 1997. Carrie Bradley went on to play with The Breeders (who covered Ed’s “Drivin’ on 9” on their Last Splash album) and 100 Watt Smile. She now lives in New York. Neno Perrotta and Dani Leone went on to have writing careers. The former now lives in Ohio, and the latter writes about food for the San Francisco Bay Guardian under the name L.E. Leone. Leone’s current band is called Sister Exister.